As a long-time Amon Amarth fan, my heart always starts pumping just a little bit faster when they have a new album coming out. “The Avenger” and “The Crusher” were and still are albums of greatness, not to mention 2006’s “With Oden On Our Side”. 2008’s “Twilight Of The Thunder God” fell nothing short of amazing and I can say with all confidence that “Surtur Rising” is a phenomenal piece of crushing metal. 'War Of The Gods' opens with speed and aggressive vocals that are supplied by Johan Hegg and eventually delves more into a melodic landscape that has the sounds of battle in the background. The second track, 'Tock’s Taunt- Loke’s Treachery Part II' is a follow up of 'Hermod’s Ride To Hel-Loke’s Treachery Part I' from the 2006 “Oden” album and carries more of the traditional Amon Amarth war cry. 'Destroyer Of The Universe' pummels you with shredding guitar riffs supplied by Johan Soderberg and Olavi Mikkonen and incredible drum work from Fredrik Andersson while Ted Lundsrom’s solid bass playing carries a lot of power and keeps the tempo moving throughout the track. When Amon Amarth creates an album, they create a story and when you listen to it feels like your being taken through the story with them. From the bloody battlegrounds to the great kingdom halls to the quiet villages along the countryside you feel like you’re a part of it. You can see Surtur gathering his sword to battle his enemies and dominate over the Earth. 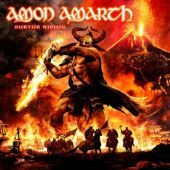 “Surtur Rising” is not just an album it’s a fantastic tale that’s presented with honor and dignity. This is some of the band’s most dynamic work yet and I cannot emphasize enough how you need to pick up a copy when this is released!